NEW Link: $1/2 StarKist Pouches = $0.50 at Price Chopper Plus Part of Gas Cat! 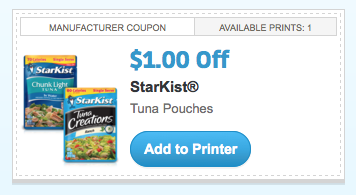 There is a new link available for Starkist Tuna Pouches! Pay only $0.50 each at Price Chopper this week after coupon plus it's part of the buy 10 select items get $0.10 off per gallon of gas promo. Only the plain one had the bottom portion of the tag that shows the gas promo. The others were marked 10/$10, but they didn't have the gas promo on the tag. That's why I wasn't sure. So I just now realized after looking over my receipt that even though I bought 20 of the $10/10 items, only $14.00 worth was counted. All 20 items have a * next to them on the receipt, so it doesn't make sense. I bought 4 Chobani yogurts, 4 plain Starkist pouches, 6 Idahoan potato packs, and 6 Larabars. I'll have to go back to the store and have them add the 10 cents I was cheated, which is a hassle. Others may want to check their receipts to make sure everything was credited.